A majority of Americans don't think it is appropriate to build a mosque and Islamic cultural center two blocks from the site of the 9/11 terrorist attacks on the World Trade Center, according to a new CBS News poll. Nearly three of four Americans -- 71 percent -- say building a mosque so close to the site is not appropriate while just 22 percent say it is appropriate. How one views Islam informs how they feel about the proposed construction of the mosque near Ground Zero. Those who have a favorable opinion of Islam are more inclined to think the mosque is appropriate with 50 percent calling it appropriate and 42 percent saying it isn't. Those who view Islam unfavorably decidedly think it's inappropriate 88 percent going against it to 9 percent. 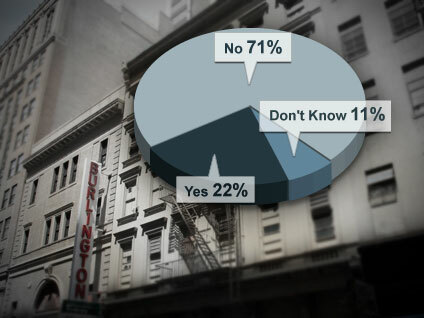 Nevertheless, most Americans also agree that the developers do have a right to build a mosque there. Sixty-seven percent say they do while 29 percent say they do not. Overall, 24 percent of Americans have a favorable impression of Islam while far more -- 39 percent -- have an unfavorable opinion of the religion. Nearly as many-- 37 percent -- don't have an opinion. This poll was conducted among a random sample of 1,082 adults nationwide, interviewed by telephone. Phone numbers were dialed from random digit dial samples of both standard land-line and cell phones. The error due to sampling for results based on the entire sample could be plus or minus three percentage points. The error for subgroups is higher.